The United Nations has declared 2017 as the year of sustainability. And its affiliated organisations have set subject matters keeping relevance with the theme and chalked out various programmes accordingly. The United Nations World Tourism Organisation (UNWTO) has announced its theme for 2017: ‘Sustainable Tourism for Development’. 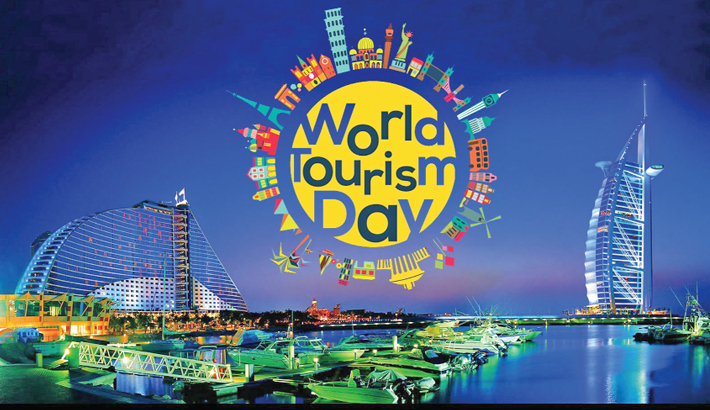 The theme of the World Tourism Day this year is ‘Sustainable Tourism: A Tool for Development’. Bangladesh is a member country of the UNWTO and it is trying to focus on the sustainable development for improving its tourism industry in line with the global goal 2030 i.e. Sustainable Development Goal (SDG). We are familiar with the SDGs. Particularly the SDG 8, 12 and 14 are directly and indirectly pertinent to the sustainable tourism development. Achieving these sustainable goals by 2030 as set by the UN is not easy at all. And with regard to tourism, the way to achieve the goals is quite spikier. Bangladesh needs to go many miles far and fast for the purpose. However, we have some points of consolation. Bangladesh has already initiated some programmes for the sustainable tourism development in line with the SDGs associated with the tourism industry. For employment generation and poverty reduction, Bangladesh Parjatan Corporation (BPC) has been carrying out community-based tourism (CBT) development endeavour in different parts of the country. For the development of sustainable tourism in coastal areas, BPC has been creating facilities in Cox’s Bazar and Mongla under the Public Private Partnership (PPP) initiative. Also to develop island-based sustainable eco-tourism facilities like those in Maldives, BPC has already carried out a feasibility study. We are going to create island-based eco-tourism facilities in the country as well. For sustainable tourism development, the UNWTO has set some code of conducts and published those in a book titled ‘Global code of Ethics’. It has also circulated the book to the member countries. Bangladesh has been progressing in the field of tourism following the guidelines in the book. In line with the sustainable tourism development endeavour, the UNWTO has issued a slogan ‘Travel, Enjoy and Respect’. It also emphasises the responsibilities of tourists for achieving the sustainable tourism goal and thereby developing the tourism industry and the economy of a country. Tourists will definitely travel to a destination for their recreation, enjoyment and gaining knowledge. But this should not hamper the privacy of a given community or society. Tourists must show utmost respect to the local community, local culture and their traditions. The UNWTO sponsors ‘Global Code of Ethics’ that enlists many codes of conduct to be observed by its member countries. As for example, travel agents and tour operators in no way deceive tourists or give false information while offering package tours. They should provide proper services as per the tour itinerary. Tourism stakeholders will refrain themselves from using child labour in the tourism industry. No tourist and tour operator will engage any child in prostitution. No tourist or tourism stakeholder will sexually harass any female tourist during her travel alone. Travel agents should not sell any package that harm nature or bio-diversity. Tourists should not demand anything that is illegal or contraband in a particular destination he or she is travelling to. No tourist or service provider of the tourism industry should get involved in smuggling of artefacts or valuable archaeological remnants. Each country should have tourism crisis communication plan involving all the tourism stakeholders. The Tourism Policy framed in 2010 has included the issue of sustainable tourism development and enumerated various directives to implement the Global Code of Ethics. Moreover, BPC has translated the UNWTO’s set of ‘Global Code of Ethics’ in Bengali and already distributed its printed version among the tourism stakeholders some years back. This document is an essential guide for the sustainable tourism development. The code of conducts that are mentioned in the book must be well interpreted and implemented by all the governments of the UNWTO member countries for sustainable tourism development in the globe. The UNWTO also suggests monitoring the proper implementation of the set codes of ethics. Bangladesh, though in its murky road towards the sustainable tourism development has initiated some activities like community tourism development around ‘Sonargaon Folk and Art Museum’ and ‘Panam City’ under Narayanganj district, at ‘Kantjeu Temple’ in Dinajpur, ‘Mahasthangarh’ in Bogra, ‘Paharpur world heritage site’ in Naogaon and ‘60-dome Mosque world heritage site’ in Bagerhat. Bangladesh Parjatan Corporation (BPC) and Department of Archaeology (DoA) have initiated some joint programmes for the preservation and conservation of the archaeological sites as well as their proper display to tourists. For proper interpretation of those sites, some professional guides are being developed as well. Bangladesh, though yet to appear as a single popular mass tourism destination in the world map, it may go for implementing the code of conducts from its king off stage for creating a positive image across the globe. However, many workshops, seminars and publications are necessary to sensitise the tourism stakeholders of the country. Bangladesh sticks to implementation of sustainable tourism development policy. So the economic impact of the tourism industry definitely will appear tangible to all. Thereby, Bangladesh will also be able to attract more and more high-spending eco-tourists to this country from abroad.